Great landscaping isn’t worth much unless it’s maintained. And what keeps your outdoor areas green and healthy? Water, of course. 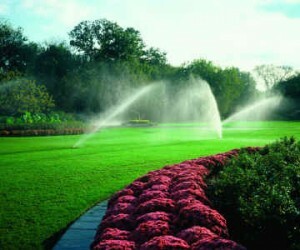 If you don’t have the time to do it yourself or money to hire someone else to do it, an irrigation system is ideal. But installing an intricate sprinkler system is not for the amateur DIYer, so get advice and compare quotes from several Minnesota landscaping companies. Installing an automatic irrigation system will ensure your yard will always look its best, and will do all the watering for you, even when you are away from home! An Irrigation & Sprinkler System will ensure your yard will always look its best! An underground irrigation system is just like an invisible garden hose in your lawn and garden. They can be operated from a central control panel in your home. This allows us to divide your property into zones, giving you the flexibility to water specific areas, at specific times. If a particular area does not require as much water as another, an underground sprinkling system permits you to accommodate the situation, thus saving you money and conserving precious water. Timers provide you with the luxury of watering your property even when you are not present. A property is divided into areas (depending on the volume of water you have), called stations or zones. A controller/timer tells each zone when to water and when to stop — depending on what you determine your lawn needs. It is very efficient because no water is wasted on sidewalks, driveways and streets due to the sprinkler head placement and precise directional angling. Most homes report they use less water. Because of automatic timing, there is no over watering. Water Scheduling – Most healthy lawns require 1 to 1-1/2 inches of water per week. Watering too often in the evenings can cause mildew, rot and allow your soil to become susceptible to other lawn diseases. Frequency: Two or three times per week, depending on the density or porosity of the soil. Duration: Heavier watering allows the water to penetrate the soil and get down to the root system as long as you don’t waste water through runoff. Time of Day: Early morning – best coverage because municipal water pressure is up, less wind for more even distribution and less evaporation from the sun.